In this section we can modify and manage the operating parameters of the Pandora FMS console, which will affect its general functioning. In the Setup section we will find all the configuration options described below. Language code It's the combo in which you're able to select the console's main language. It's the field intended to identify the directory in which the remote configuration of the agents is stored. It's '/var/spool/pandora/data_in' by default. This feature is only available to Enterprise Versions of Pandora FMS. Introduce the PATH where the Phantomjs is installed must be introduced in order to be used by Pandora FMS. It defines a static and symmetrical password which is used to create a hash value in order to render the automatic validation by URL possible. It's used to incorporate Pandora FMS into other web applications, provides a user name as a parameter, generated by the user's name by using a hash. This password allows an automated validation within Pandora FMS without the need of having to introduce a password. In order to see an example of this integration, please take a look into the file named '/extras/sample_login.php' from the Pandora FMS console. The combo in which you're able to select the origin of the date and hour between the database and the system. The first one is used if the database is located on a system different from the console's. The field in which the automatically conducted update check for the Open Update Manager is configured. This function causes the console to contact the Pandora FMS Update Server at Artica ST each time you start the session and sends anonymous information about your Pandora FMS usage (just your number of agents). The attachment directory is used as a temporary folder for Pandora FMS. All attached incident data are also stored in this folder. It's located under '/var/www/pandora_console/attachment' by default. You're required to have writing rights for the web server. The map's images and other temporary files are stored there, too. This is a list of IP addresses (not FQN and one per line) which are going to have access to the Pandora FMS web-services API and other minor functions like the RSS event feed or the marquee view. You may use '*' as a wild card in order to define 'any' IP address and e.g. '125.56.24. *' in order to grant access to all hosts within the '125.56.24. *' subnet. It's the authentication method used to access the Pandora FMS API from the outside. Please read the section named Pandora FMS External API. in order to obtain more information about this topic. The field intended to enable or disable GIS features within the Pandora FMS Console. Please read the section named GIS Console in order to obtain more information about this topic. The field intended to enable or disable the Netflow feature. It defines the timezone in the moment the Pandora FMS Console is located. It's also the combo in which it's possible to pick the zone and timezone. It's the combo which was designed to pick the sound for fired alerts. The combo which was designed to pick the sounds in case a module is in 'critical' state. The combo which was designed to pick the sounds in case a module is in 'warning' state. Please define this value if your Pandora FMS works across an inverse proxy or is e.g. configured by Apache's 'mod_proxy' option. If set to 'yes', none of the events or alerts are going to be generated, but the agents continue to receive data. The string modules which contain several lines are going to be shown as a command output. It's the directory in which the server logs are going to be stored. Maximun size to show in system log extension. Level of presence of contextual help to the user. Activate or deactivate the possibility of creating scheduled stops on past dates. The purpose of this is to modify information for SLA reports. Limit of elements that can be modified by massive operations at once. Allows to enable or disable the display of manually disabled agents in certain console views. Complete path where the audit log of the console will be saved in text format. When enabling this parameter , the agent creation menu checkbox, which contains the alias entered in the form and also saves this as the agent name, is activated by default. When enabling this parameter, anew token will appear in the creation or edition of an agent to prevent creatnig a new agent with a duplicated IP. Now we're going to describe some fields which are exclusive to the Enterprise version of Pandora FMS. Configuration in the console to register the node into a Metaconsole. You can also check the conection to the Metaconsole vía API and see the status of the node in the Metaconsole. Configuration that allows to associate SNMP traps and agents. When this option is enabled, when a trap with the same IP as an agent is received, a module is created in the same agent with the name SNMPTrap and of the async_string type. The module value will be that of the last OID received, that is, it will be updated with the arrival of new traps. If Yes and change status is selected, besides updating the value when receiving the trap, the module is set to CRITICAL status. To return to the NORMAL state, all traps associated with that agent must be validated or deleted from the SNMP console. In the case of Yes without changing status only the value of the module is changed. This option is going to activate the Enterprise version's ACL System which is much more flexible than the default one. Please read the section named Enterprise ACL System if you like to obtain more information about this topic. This field defines the maximum size of the collections. Please read the section named Monitoring by Policies if you like to obtain more information about this topic. If the event replication is activated, the received events are going to be copied into the meta console's remote database. Metaconsole database configuration for the event replication. If we have event replication activated to be able to monitor them from the Meta Console, we can choose if the events can be seen in the Instance, without being able to make any option on them. The inventory modules included into the changes blacklist are not going to generate any events if a change occurs. Activate the Update Manager option. A threshold must be set for the map of supernets of the IPAM extension for the critical range of occupied addresses. Warning threshold for occupied addresses A threshold must be set for the map of supernets of the IPAM extension for the warning range of occupied addresses. Configure here a series of values such as the outgoing address, the SMTP server ID, SMTP port and, if necessary, the user and his email password. Remember! This section substitutes the previous mail configuration located in the PHP configuration file (email_config.php). If you are using a Pandora FMS ISO installation and you want to use the Postfix server distributed in it, make sure that your Pandora server is able to resolve through its DNS server the mail server in charge of your e-mail domain. Make sure also in this case that your mail server accepts the emails redirected from Pandora server. You're able to utilize the password policies from Pandora FMS Enterprise versions 5 and above. It's a group of rules which apply in the moment you're defining the Pandora FMS user passwords. This policy was designed to be applied to standard and administration users, as we're going to see below. You're required to have administrator permissions in order to enable the password policy. It's configured by clicking on 'Administration' and 'Setup' in a section called 'Enterprise Password Policy'. It's intended to enable or disable the password policy activation. It's disabled by default. It's the password's minimum size. The default value is '4 characters'. The password is required to have numbers. It's disabled by default. The password is required to have symbols. It's disabled by default. The password's expiration period. The default value is '0', which means that it never expires. Force change password on first login: It forces a login by password in the moment of first login after the user's creation. It's disabled by default. It's the feature intended to determine time the user is blocked if it exhausts the maximum number of failed log-in attempts. The default value is '5 minutes'. It's the number of allowed failed login attempts in the moment of logging. The default value is '5 attempts'. Apply password policy to admin users: It's the feature to include the password policy also to administrator users. It's disabled by default. It's used to enable or disable the password history. It's disabled by default. It's the number of previous passwords which are considered inappropriate for a password change, because they've been used before. The default value is '3'. This token activates the "Forgot your password?" box, giving the user the option to receive an email for the current password change. This feature allows you to enable the Pandora FMS Database History options in order to save old data within an auxiliary database. This system accelerates all queries and accesses to the data. Enable history database: It's intended to enable or disable the database's history feature. Enable event history: Allows us to use the events history feature. Host: The host name of the history database. Port:: The port of the history database. Database Name: The name for the history database. Database User: The user allowed to access the history database. Database Password: The password to access the history database. Days: The number of days for the data to be transferred to the history database. Step: The buffer size for the data transfer (in number of items). The lower the value, the slower the data transfer, but it also lowers the performance reduction within the main database. An appropriate default value is '1000'. Delay: The delay time (in seconds) for the data block transfer between main and history databases. An appropriate value is '2'. Event Days: Number of days before events are transferred to the historical database. If you select this option, a window like the one shown on the picture below is going to appear. ElasticSearch IP: IP of the server containing the installed ElasticSearch ElasticSearch Port: Port through which the ElasticSearch server sends the information. By default 9220 Number of logs viewed: Number of events that can be displayed Days to purge old information: Number of days of information collected before being deleted. Due to certain security reasons, the users with administrator privileges are always required to use the local authentication of Pandora FMS. If we select this option, the window shown on the picture below will appear. Enable this option if you want to fall back to a local authentication if the Active Directory remote authentication fails. Enables/disables the automatic creation of remote users. This option makes possible for Pandora FMS to create the users automatically once they log using their LDAP user. The three following fields will appear ONLY if autocreation is ENABLED. 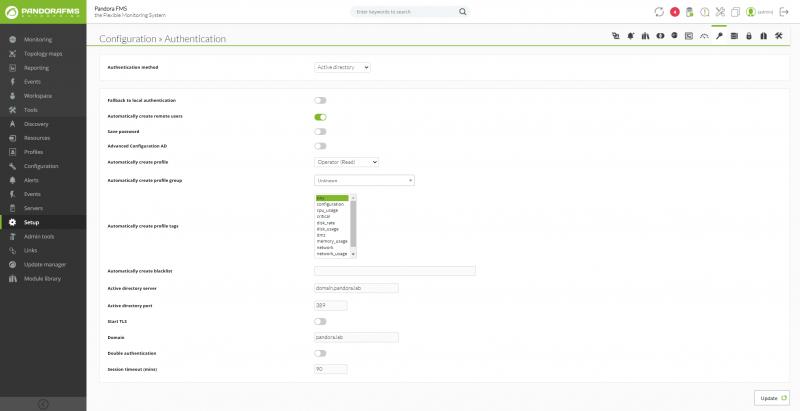 You can check the different profiles on the section: Administration -> Manage Users -> Manage Profiles. When the automatic creation of remote users is active, this field makes it possible to assign the desired tags to a group. 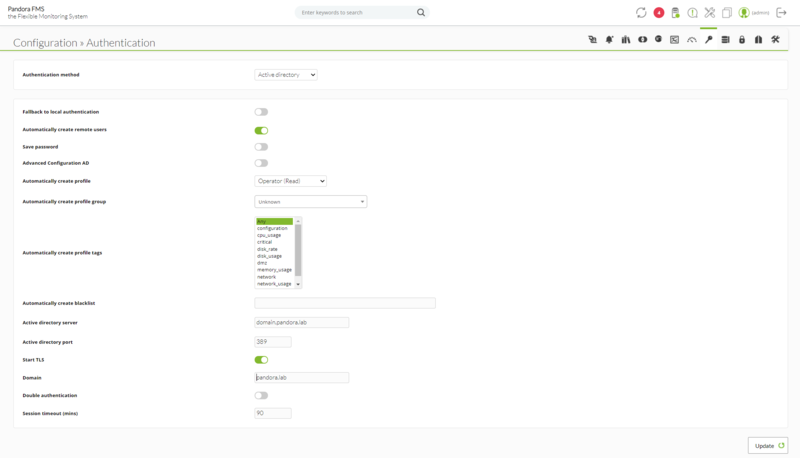 The different groups can be checked on the section Administration -> Manage Monitoring -> Manage Groups. A comma separated list of users that won't be created automatically. The Advance Permissions AD configuration will be used if this option is enabled. To add more than one, just add a new line. If the configuration isn't correct, the profile won't be added to the user. Define here the Active Directory server port. To use the Transport Layer Security (TLS) protocol between client and server. Domain that the Active Directory will use. Since the 6.0 version, it will be possible to enable this option to allow the users to activate the two step authentication in their accounts. To know more about enabling the two step authentication in an user account, you could read this quick guide. This functionality requires the server and the mobile devices has the date and time the more synchronized and precise as possible. Set the time in minutes of the session timeout without the user performing any action. If you never want to disconnect the user, set to -1. Every time a user logs in, his permissions will be checked to see if there has been any change. In that case, he will have to log in again. - The Pandora server should be able to resolv the FQDN of the domain controller, and it must be listening to basic and SSL modes (default ports 389 and 636). - The security certificate must be placed on the Pandora server. Review the configuration and press FINISH to end the wizzard. You must recevie a message: "The export was succesful." at the end of the wizzard. At this point, we must copy the .cer file to our Pandora FMS server. Uncomment the line TLS_REQCERT ALLOW if your certificate is self signed. If the domain controller is not responding or have no ports in OPEN status, check any conectivity or name resolution issues. Please enable this option if you intend to fall back to a local authentication if the LDAP remote authentication happens to fail. It enables and disables the remote user creation automatically. 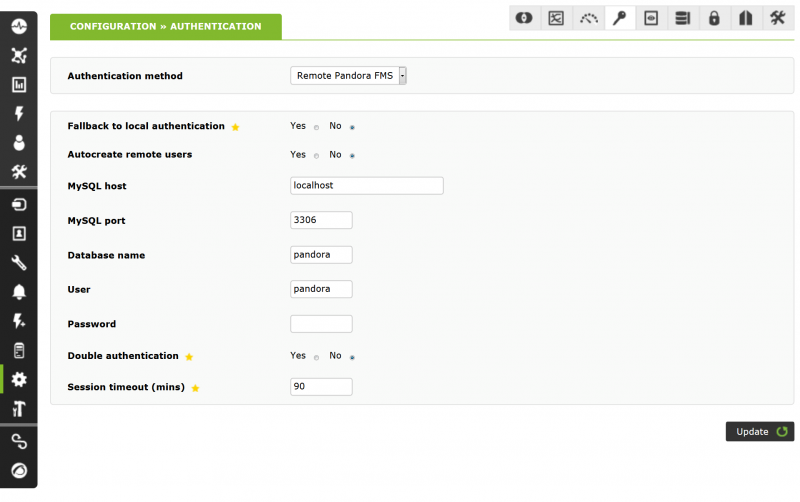 This option allows Pandora FMS to create the users automatically, once logged in by using LDAP. If enabled, the three below mentioned fields are going to be available. If not, the fields are blocked. Enabling this option will save the LDAP password to the database. When searching in LDAP, you can choose whether to use PHP's native function or use the local command ldapsearch. We recommend using the local command for environments that have an LDAP with many elements. When the user is created, we save in the database the name or email for login. If this option isn't enabled, the simple system for creating user profiles will be used (it uses Autocreate profile, Autocreate profile group, Autocreate profile tags). 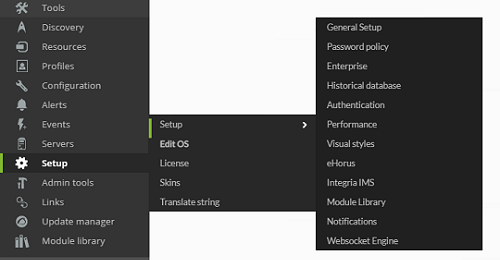 If this option is enabled, a list of all saved advanced permissions will appear. 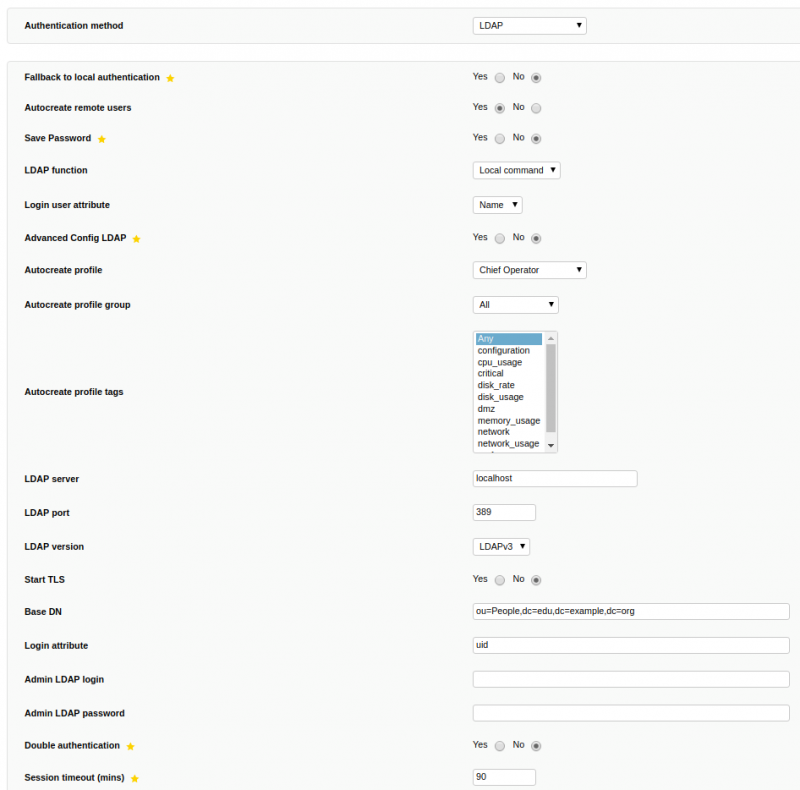 We can add new permissions by selecting the profile, groups and tags next to the attribute filter. If the user meets any of these attributes (for example, an organizational unit or specific group) then the user will be created. In the example image we can see that all LDAP users that are going to be created in Pandora and that have the attribute "group_id=16" or with the attribute "email" ending in "@artica. es" would receive the profile of "Operator (Read)" about the group "All" and all the tags. NOTE Is very important when you put the attributes you must put them with the following format Attribute_name=Attribute_value as shown in the example of "group_id=16". You're also able to review all available profiles by clicking on 'Administration' -> 'Manage Users' and 'Manage Profiles'. You're also able to create new groups or to list all available groups by clicking on 'Administration' -> 'Manage Agents' and 'Manage Groups'. While the automatic creation of remote users is active, this field makes it possible to assign a tag to these users that are created automatically. It's intended to switch the Transport Layer Security (TLS) protocol for communications between client and server on or off. The Distinguished Name (DN) used by the LDAP server, e.g. 'ou=People,dc=edu,dc=example,dc=org'. The login attributes used by the LDAP server during the authentication process, e.g. the UID. For LDAP systems that need to perform authentication prior to the user's search, you must specify in this field a user with permissions to perform the search. In this field we will indicate the password of the user of the previous field. 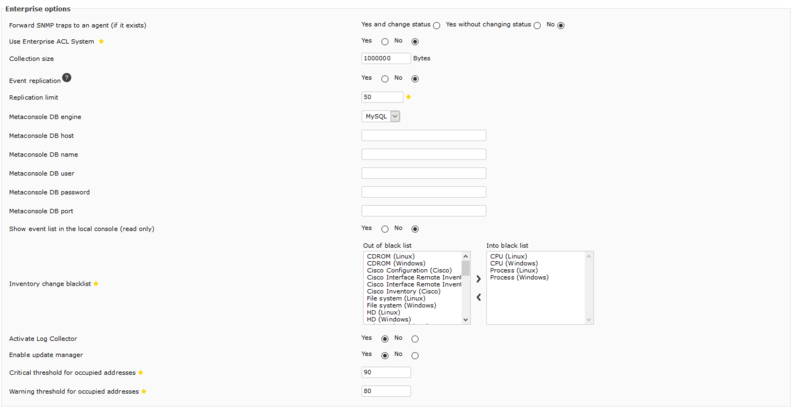 If you select this option, the configurable fields are going to disappear. This option conducts the authentication by using the internal database of Pandora FMS. Please enable this option if you intend to fall back to a local authentication if the Integria IMS remote authentication happens to fail. The Integria IMS server's address. The MySQL port of the Integria IMS database. The Integria IMS database's name. The user allowed to access the Integria IMS Database. 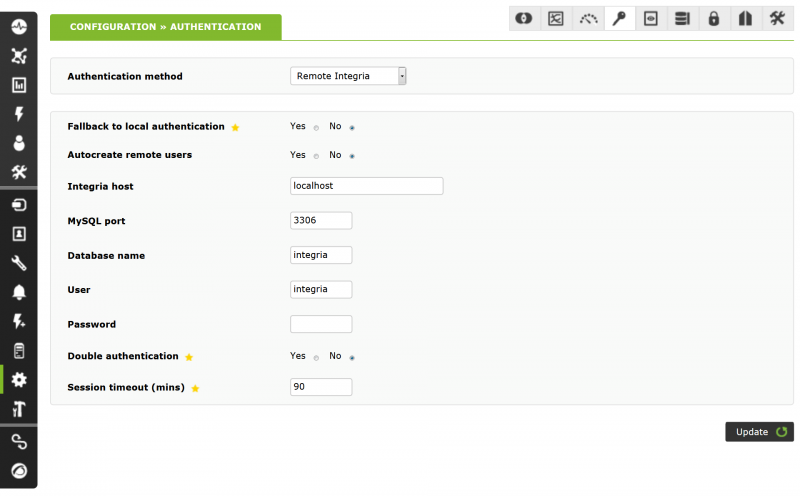 The password to access the Integria IMS Database. Please enable this option if you intend to fall back to a local authentication in case the Pandora FMS remote authentication happens to fail. The Pandora FMS server's address. The MySQL port of the Pandora FMS database. The name of the Pandora FMS database. The user allowed to access the Pandora FMS Database. The password to access the Pandora FMS Database. 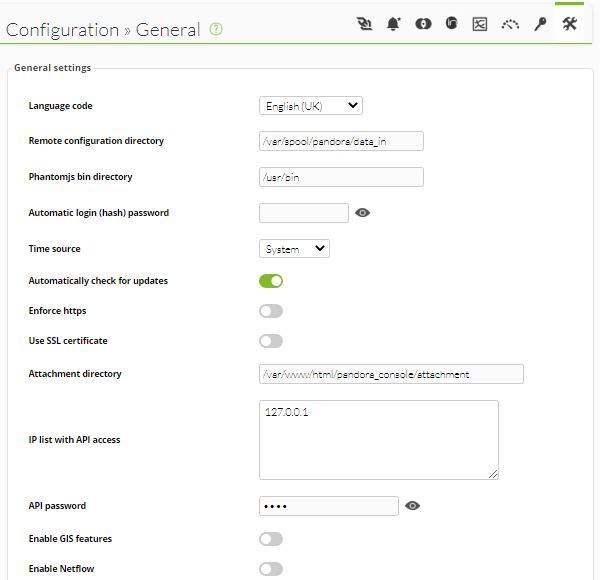 For the configuration of SAML, you can read this section. It indicates if the "pandora_db" is being executed and the time of the last execution of this one, in case it exceeds 12 hours without being executed it will mark a critical state. This parameter will only appear if there is a historical database configured in Pandora FMS. It indicates if the "pandora_db" is being executed in the historical database and the time of the last execution of this one, in case it exceeds 12 hours without being executed it will mark a critical state. The maximum number of days before the events are going to be deleted. The maximum number of days before the traps are going to be deleted. The maximum number of days before the audit events are going to be deleted. The maximum number of days before the string data are going to be deleted. The maximum number of days before the GIS data are going to be deleted. The maximum number of days before purging the database. This parameter is also used to specify the maximum number of days before deleting the inventory data. The maximum number of days before compacting the data. It's the maximum number of days before the deletion of unknown modules. Field to define the number of days from which the disabled agents will be eliminated. Field where you define the number of days from which the special days that have already passed will be eliminated. Field where the number of macros that can be used for alerts is defined. Field where you define the number of days from which the inventory data will be deleted. 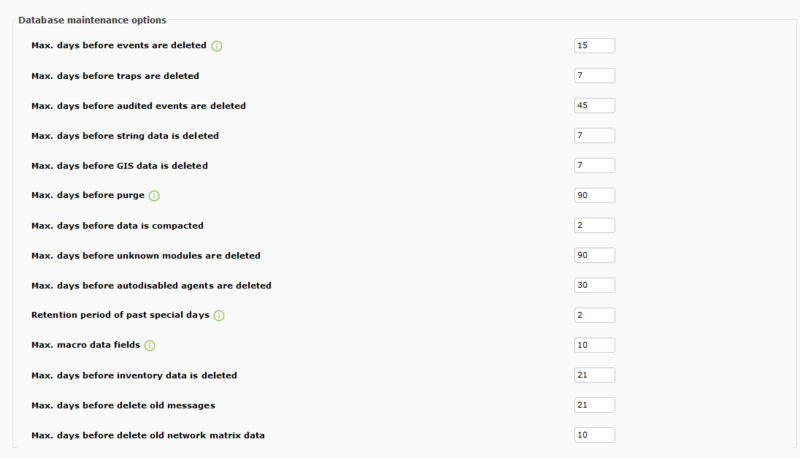 Field where you define the number of days from which the messages received will be deleted. Field where you define the number of days from which the Network maps data will be deleted. Field where the maximum number of days before deleting data is defined. Field where the maximum number of days before compacting data is defined. This is the length of the compacting interval in hours. For example, a module with an interval of 5 minutes generates 288 values per day. If this interval is set to 2, the data will be grouped in intervals of 2 hours and the average will be made, resulting in 12 values per day instead of 288. The higher this value, the lower the resolution. A value close to 1 is recommended. Field where the maximum number of days before deleting events is defined. Field where the maximum number of days before deleting the data strings is defined. NOTE: these parameters will only appear if there is a historical database configured in Pandora FMS. Field where the maximum number of data that the graph will represent in real time is defined. This is the length of the compacting interval in hours, e.g. a module with an interval of 5 minutes generates 288 values per day. If this interval is set to '2', the data is going to be grouped in 2 hour intervals and averaged, resulting in 12 values per day instead of 288. The higher this value, the less the resolution. A value close to '1' is recommended. It's default number of hours for event filtering. If the value is '24 hours', the event views are only going to display the events which occurred in the last 24 hours. This field also affects the display, counting and graphing of events in the tactical view. It enables or disables the real-time statistics. If real-time statistics are disabled, this is the parameter to define the refresh time for the batch statistics. The agent's access graph renders the number of agent contacts per hour in a graph on a scale of 24 hours. This feature is intended to learn the contact frequency for each agent. Under some circumstances, it could take quite a long time to process the data, so if you have slow hardware resources, it's recommended to disable it. It's the maximum number of stored files in the attachment directory. Enables or disables the deletion of uninitialized modules. Number of blocks in which "pandora_manage.pl" divides a time interval. A larger value implies larger blocks of time, which means performing more operations, albeit lighter. On overloaded systems and very large databases it may be advisable to increase this value even if the purging of the data takes longer. For example, in a database with 1 day of data to purge, the time interval would be divided into 100 blocks of 864 seconds (using the default value). The default and recommended value is 100. Number of rows that "pandora_manage.pl" processes in a single SQL query. This means that for each block of time defined by the "Big Operation Step to purge old data" parameter, a maximum of 1000 records will be purged with each query (using the default value). A higher value involves larger queries, which means fewer operations, but heavier ones. On overloaded systems it may be advisable to reduce this value, even if the purging of the data takes longer. The default and recommended value is 1000. Field where the maximum number of items in the graph container view is defined. Field where you define the maximun number of events that the Event Responses massive operation can perform. 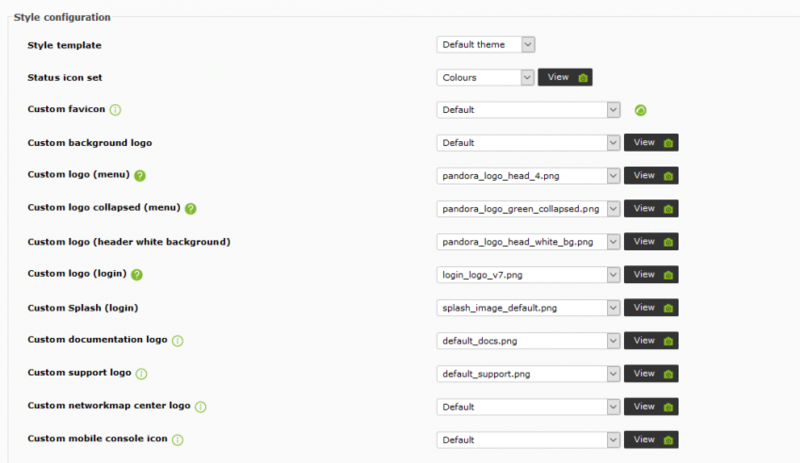 In this section you can manage all the visual elements of Pandora FMS console. The block size for pagination. 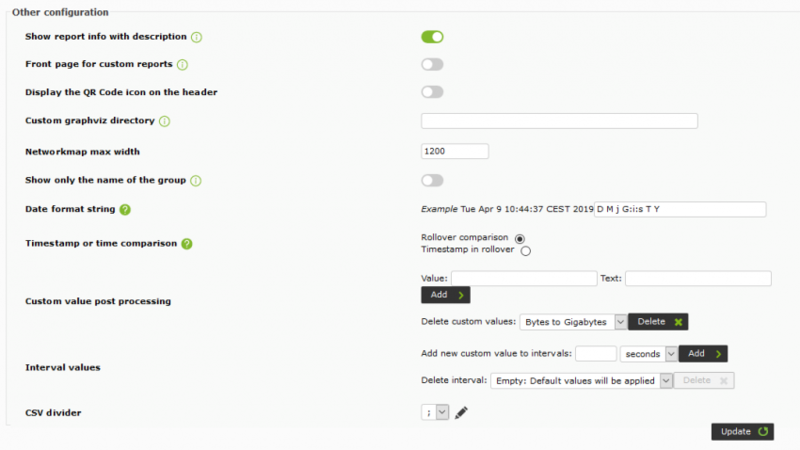 This parameter determines the refresh interval for visual console pages. It activates the pagination within the module list. Proc type data represent binary states of a module. In the database they are collected as a number, but could also be represented in a descriptive way with an identifier for each of the two states. If this option is enabled, this second form of representation is used. When the option Display data of proc modules in other format is activated, text that appears to replace the number when the module has a correct status. When the option Display data of proc modules in other format is activated, text that appears to replace the number when the module has a fault state. This parameter will configure if the side menu drops down when we left click on it, or when we hover the cursor over it. Font size of the services. Distance (in pixels) between two elements of the service maps. This value cannot be less than 80px to avoid overlaps. It defines the Pandora FMS console's web style. You're able to add new skins or templates by including CSS files in the folder called 'include/styles'. This combo was designed to select the icons used to visualize the module's states. By default the colors red, yellow and green are used. You may replace the colors by other conceptual icons which allow you to differentiate the module's status if you're e.g. required to adapt the system to users with color blindness. You can change Pandora's favicon as well as leave the default one. It must be inico format and its dimensions must be 16x16 for it to work properly. You can add icons to choose from in the images/custom_favicon folder. You can place your custom images to the folder called 'images/background'. This feature is only available in the open-source version and allows you to display your logo in the Pandora FMS console header. You may use any PNG picture. The default size for a picture is 60x139 pixels. You may upload your logo to the directory called '/images/custom_logo' by using the file manager. This feature is only available in the open-source version and allows you to display your logo in the Pandora FMS console header in a collpased mode. In some parts of the tool there is a dark background and in other parts there is a white background. For this reason, Pandora FMS can be configured with an alternative icon for the pages that have a white background so that it can be displayed well in all views. The direction you go up is the same as the previous one. ICustom icon for the login section. To upload more icons, on the route /images/custom_logo. Custom icon for the logo that appears just to the right of theinputs' of text on the login screen. The path to upload more icons isenterprise/images/custom_splash_login. Icon for the link to the documentation and support of the login screen. If left blank, no icon will be displayed. The path to upload more icons isenterprise/images/custom_general_logos/. You can also customize the icon of the central node of the network maps. The path to upload more icons isenterprise/images/custom_general_logos/. You can use the Pandora icon by default. Personalization of the icon of the mobile console. The path to upload more icons is enterprise/images/custom_general_logos/. By default it will put the pandora icon with a subtitle that indicates that it is the mobile console. Title and subtitle of the login screen. URL address to which the "Docs" link in the top bar of the login screen leads. URL address to which the "Support" link in the top bar of the login screen leads. By default, the product name is Pandora FMS. However, in the enterprise version, the user is given the option to change it to another text string for a more customized version. By default, Pandora's author's name is Ártica ST. However, in the enterprise version, tthe user is given the option to perform a 'rebranding', that is, to change Ártica ST to another text string for a more customized version. Remove the watermark from the charts. Hide all Pandora's help. This configuration option affects both the modal windows and the wizard and other links to the Pandora documentation. The header is always displayed, i.e. it is not hidden when scrolling. This option minimizes the side menu after a few seconds. Please enable this option if you intend to obtain a label which contains the agent's name in GIS maps. However, if your maps contain a lot of agent names, they're very likely to be unreadable. The agent's icon to be used on the GIS maps. If you set it to 'none', the group's icon is going to be used. It's the main font's selector combo. This True-Type font is used in Pandora FMS graphs. Font size of Pandora FMS graphics font. If the agent's name consists of a lot of characters, it's required to truncate it into N characters in some sections within the Pandora FMS console. If the module's name consists of a lot of characters, it's required to truncate it into N characters in some sections within the Pandora FMS console. Description size text If the description consists of a lot of characters, it's required to truncate it into N characters in some sections within the Pandora FMS console. If the item's title consists of a lot of characters, it's required to truncate it into N characters in some sections within the Pandora FMS Console. It's the color for the minimum value in module graphs. It's the color for the average value in module graphs. It's the color for the maximum value in module graphs. These colors are used in Pandora FMS graphs. Number of decimals shown in reports and visual consoles. It must be a number between 0 and 5. Number of decimals shown in graphs. It must be a number between 0 and 5. It's intended to switch the round corners of the progress bar and other Pandora FMS graphics on or off. Type of representation for the module graphics. You can choose between area or line graphics. Type of representation for the interface graphics. You can choose between area or line graphics. Shows a line with the 95th percentile on the graphs. None: the TIP option of the graphs setup will be deactivated (default option). All: The TIP option of the graphs menu will be activated. Boolean graphs: The TIP option will only be activated in the Boolean-type graphs. The graphs (with the exception of the TIPs) are an approximate representation of the data available. This approach involves splitting the period to be represented into several pieces and calculating values that indicate the state of the module in each of these sections. The values that are calculated are the average, minimum and maximum. To paint only the average and have cleaner but slightly less representative graphs, you must activate this option. Drop-down to indicate whether you want your favorite visual consoles to be displayed in the menu. Favorite visual consoles will appear in the side menu, but due to performance and overlap problems, they cannot all appear in the case of a high number. With this token, the number of visual consoles is limited. Line width on visual consoles. This option can be changed within the visual console itself individually for each line, but the default value is detailed here. Displays the report information or only the data. The custom report's front page is going to be applied to all reports and templates by default. It's intended to display QR Code within the header. It's the custom directory in which the Graphviz binaries are stored in. Maximum width of the network maps to avoid that an unfathomable screen is shown. Show the group name instead of the group icon. The date's format. You're going to find all available options within the console's help. It defines which date and hour is used. There are two available options: The 'Timestamp in rollover' system timestamp or the 'comparison in rollover' database timestamp. It's very useful in cases the database belongs to different system other than the console. Custom values for post-processing. Updates a database table to have custom conversions from one unit to another. This parameter determines the interval values. Character or character set with which data is to be separated when exporting to CSV. The directory in which the Netflow data is stored. The time interval in seconds to update the Netflow data. The binary path for nfexpire. The maximum graph and chart resolution. The option to disable the custom live-view filters. The maximum lifetime of the Netflow data. The feature intended to resolve IP addresses in order to obtain their host names. Maximum timeout for API requests. Disabled with value 0. Under Pandora FMS it's possible to obtain the agent's location by using interactive maps. You're able to configure all parameters related to the connection of the GIS map provider, e.g. OpenLayers of Google Maps within this section. You're able to obtain further information about GIS in the section called GIS Console. The File Manager was designed to upload files to Pandora FMS. 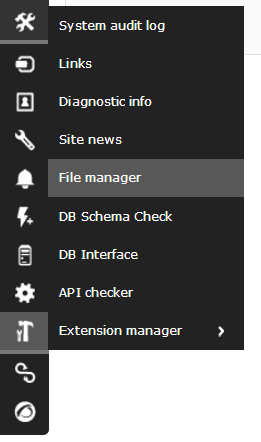 You're able to access the file manager's page by clicking on 'Admin Tools' -> 'File Manager'. If you invoke the above mentioned feature, a window like the one shown on the picture below is going to appear. The content of the 'images' folder within your Pandora FMS installation is displayed in this section. In it, you're able to browse directories, create files and folders and upload and download files from your local hard disk. You're required to use the buttons shown on the picture below in order to do that. 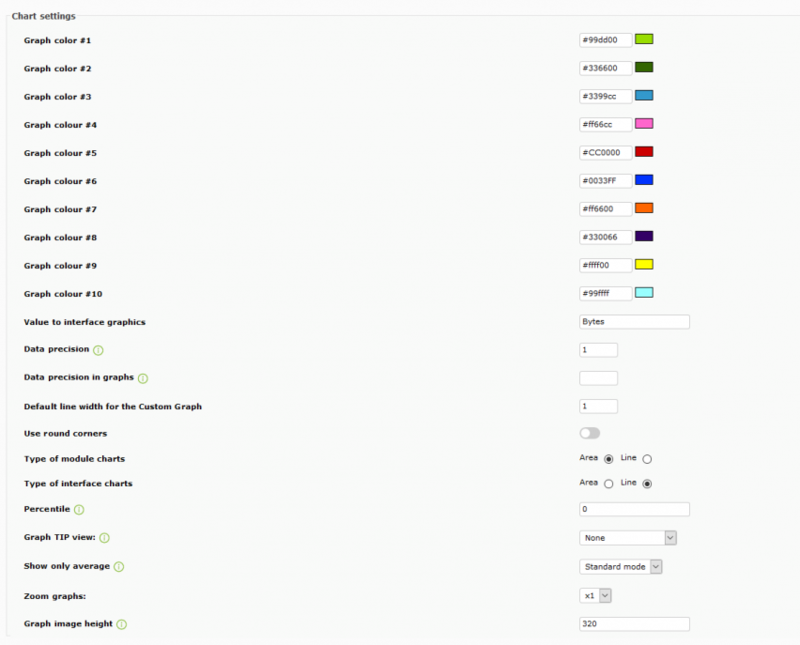 The buttons are the following: 'create folder', 'create text file' and 'upload file'. After clicking on the 'create folder' button, the field shown on the picture above is going to appear. Just enter the name of the folder and click on the 'Create' button. If you click on the 'Close' button, the dialog is going to close. After clicking on the 'create file' button, the field above is going to appear. Just enter the name of the file and click on the 'Create' button. If you click on the 'Close' button, the dialog is going to close. After clicking on the 'update file' button, the field on the picture above is going to appear. Just click on the 'Browse' button, browse your local disk and select the file you want to upload. It's also possible to upload several files at once by selecting a zipped file and selecting the 'Decompress' option. The file will be unzipped and all your compressed files inside is going to appear within the folder. 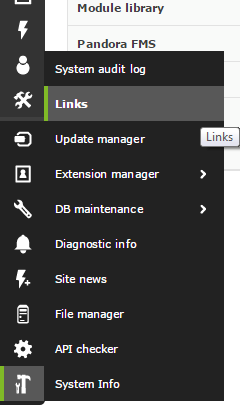 By clicking on 'Admin Tools' -> 'Links', you're able to access the link-managing page of the Pandora FMS Console. The process of creating or updating a link is very similar. Please click on the 'Add' button in order to create a new link. Please click on 'update a link' and click on the link's name. Both methods are displaying the same screen. In the first case, the screen is empty and in the second the screen displays the data of the link to be modified. Please click on the 'Create' or 'Update' button in order to create or modify the link, once all fields have been filled out appropriately. In order to delete a link, please click on the red cross which is located in the same row as the link you intend to delete. By clicking on 'Admin Tools' -> 'Site News' it's possible to add news which are going to appear in console's home page. Please click on the 'Add' button in order to create news. Subsequently, the window shown on the picture below is going to appear. Please insert an appropriate title and text and click on the 'Update' button. It's possible to delete a news by clicking on the red cross on its right or editing it by clicking on its name. This feature was designed to edit or create new operating systems. The feature shown on the picture below was designed to create or edit new operating systems. The description for the newly created operating system. Please select an appropriate icon for the OS here. This feature is explained in the section called Enterprise ACL System. This feature was designed to customize the look of the Pandora FMS Console Interface. This feature was made by changing the CSS style files and the associated icons. In order to create a new skin you're required to replicate the folder structure of the console. Images: This directory is intended to contain the skin's icons and images. Include/styles: This folder is intended to contain the skin's CSS files. The field for the user's name. The skin is going to be applied to all users which belong to the group mentioned here. If a user has a skin for itself and the group it belongs to has another one, the user's skin has a higher priority. The window intended to access the available skins is shown on the picture below. You're required to use the window shown on the picture below in order to create or to configure any skin. During the creation process, this field is going to ask you to upload the zip file. During any modification process, this field contains the name of the uploaded zip file. The groups assigned to this skin. A field intended to disable skins which aren't applied to any user. This feature is thoroughly explained in the section called Update Manager. This extension is thoroughly explained in the section called Translation of Strings. In order to update any language of the Pandora FMS console, you're required to invoke the Launchpad Translation Download Page, select the languages you intend to update (they're in *.mo file format), to click on the 'Request Download' button and to wait for an email which contains indicators and a location to download the files. Once the download is completed, please copy them into the folder called '/include/languages/' of the Pandora FMS console and your languages are updated instantly. You're required to create an account under Launchpad in order to be able to download the translation files.